This artist's rendering shows NASA's Juno spacecraft making one of its close passes over Jupiter. As the New Horizons probe leaves diminutive Pluto in its rearview mirror, another NASA spacecraft is closing on the solar system's biggest planet. NASA's Juno probe is now less than one year away from its rendezvous with Jupiter. Juno, which launched in August 2011, is scheduled to slip into orbit around the gas giant on July 4, 2016. 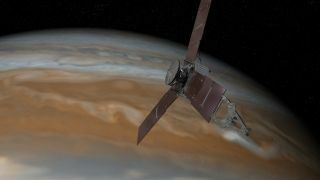 Juno will also capture the first up-close images of Jupiter's polar regions. "We're already more than 90 percent of the way to Jupiter, in terms of total distance traveled," Juno principal investigator Scott Bolton, of the Southwest Research Institute in San Antonio, said in a statement. "With a year to go, we're looking carefully at our plans to make sure we're ready to make the most of our time once we arrive." "The revised cadence will allow Juno to build maps of the planet's magnetic and gravity fields in a way that will provide a global look at the planet earlier in the mission than the original plan," NASA officials wrote in the same statement. Juno's orbit will be highly elliptical, at times bringing the probe to within just a few thousand miles of the planet's cloud tops. The 14-day version should give the mission team more time to react to any surprises that might pop up in between such close approaches, NASA officials added. "We have models that tell us what to expect, but the fact is that Juno is going to be immersed in a strong and variable magnetic field and hazardous radiation, and it will get closer to the planet than any previous orbiting spacecraft," Bolton said. "Juno's experience could be different than what our models predict — that's part of what makes space exploration so exciting." Juno is the second mission selected under NASA's medium-class New Frontiers program. The first New Frontiers effort was the $723 million New Horizons mission, which launched in January 2006 and on Tuesday (July 14) performed history's first flyby of Pluto and its moons.